Babanagar: - Babanagar is a Jain pilgrimage center which has historical significance and leads us to eon of Kalchuri era in ancient Karnataka state. Babanagar was a great ancient Jain center as the fact is attested by inscriptional and sculptural evidences. The geographical situation of this town is under Bijapur district of Karnataka state. The place is about 30 Kilometers in west direction from Bijapur Railway station. The place is renowned as “Parshwanath Darbar Digamber Jain Atishay Kshetra”. The term “Darbar” is concerned to the temple due to some miraculous events happened during period of Aadilshahi. Parshwanath Darbar Digamber Jain Temple:- Parshwanatha Digamber Jain temple is situated in narrow passages originated from Highway no. 43 passing through Babanagar village. The temple is a two storey building which seems ancient enough and a hospice is situated in front of main temple has good boarding facility for pilgrims. The temple has main gate which is so small that only a single person can enter at a time. Generally small gates were built to Jain temples in Muslim ruler’s era due to fear of iconoclasm by offenders. As we enter the temple we find ourselves in a big porch which contains main garbhagriha where miraculous sculpture of lord Parshwanatha is situated. The gate of garbhagriha is flanked by Subordinate deities of Yaksh and Yakshini. 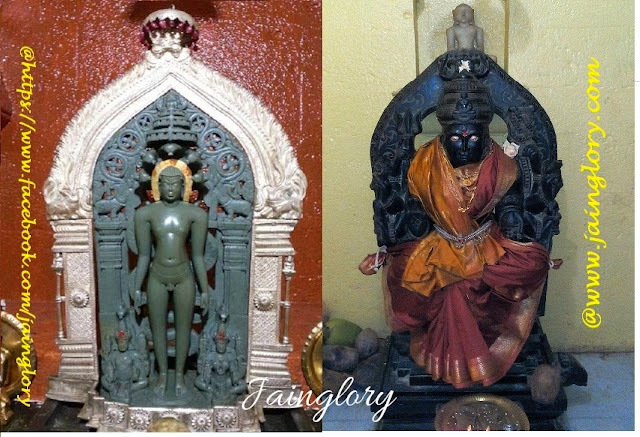 They both are carved in black stone and contains Jina icon in their head. As we enter to the garbhagriha principal deity of Lord Parshwanatha carved in Green Black stone is seen in the center. The principal deity lord Parshwanatha’s icon is small in size but very mesmeric sculpture which is full of tranquility and serenity on face. The image of lord Parshwanatha is of about 1.5 feet height and on the main vedi there are lot of metal bronze sculptures of various Jinas installed. On the second floor A Maan stambh is erected which is just above the main entrance of the temple. History of Lord Parshwanatha sculpture: - The temple is constructed for Lord Jina Parshwanatha is newer than sculpture of Jina. A folktale is popular about Lord Parshwantha is that the images of Jina was possessed by a Queen of Muslim ruler. She kept this sculpture as a toy in her valuables but she was suffered from severe pain due to disrespect of Jina. One day a layman dreamed about Jina sculpture and he went to Aadilshahi court and described the way to cure the severe pain of Queen. She was cured from disease after application of anointment water on suffering area. The Muslim ruler became very happy and constructed a temple in Babanagar near Bijapur city. Inscription of Babanagar :- One inscription from a ruined Siva temple renders a valuable information about a 12th century AD Jain temple at Babanagar. It registers a gift of land into the hands of the preceptor Manikya Bhattaraka of Mangalivedha in 1161 AD under the reign of Kalchuri emperor Bijjala. The preceptor Manikya Bhattarka belonged to Mool samgha and Desiya Gana. The town name Mangalivedha in the inscription is identical with modern Mangalvedhe near Pandharpur town. The inscription has also record about younger son of King Bijjala named “Mailugi”. The Jain temple is situated at “Kannadige” which is none other than Babanagar so it is surmised that ancient name of Babanagar should be “Kannadige”. The whole inscription was inscribed in Kannada language.